The font choices you make are as important as the clothes you decide to wear. For example, no matter how nice the suit a person is wearing, your impression of them could be ruined if they’re wearing dirty, beat-up sneakers. Your typography may only be 10% of your presentation deck, but it’ll have a major impact on how your audience absorbs the information you’re giving them. 1. Try to use safe typefaces. Just like your favorite everyday shoes, there are some typefaces that will always be safe to use in a presentation. These fonts are always clear, legible and will not distract the audience from the content of your presentation. Try using fonts like Lucida Grande, Helvetica, Georgia or Palatino. 3. Avoid using wild typefaces. Just like your outfit, if everything is too wild, people will just end up staring at you; rather than listening to what you have to say. So, apply that same thought to your presentation deck. If all your fonts are too wild, people will just spend their time looking at the deck, instead of absorbing the content. Use wild fonts as your headers, but not for the entire thing. 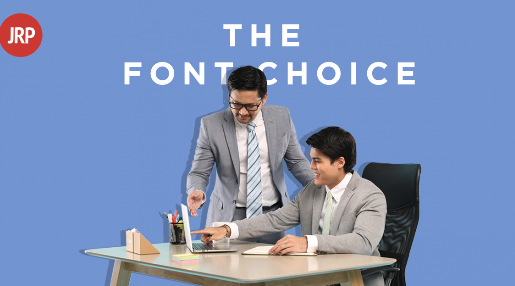 As you continue to make your presentation decks, you’ll start to figure out which fonts work best for your audience, and which ones look best with each other. Whichever font you choose, always make sure you remain confident during your presentation.